The blue squad had a ten point lead going into the half, but in the second half the gold squad took over. Led by Ian Book, the blue squad came out in the first drive of the second half with a head of steam looking to punch another one into the end zone. The drive looked promising when Jafar Armstrong bolted through a gap for a 42-yard sprint to gain possession at the gold 14-yard line. However, four plays later the gold squad came up with the red zone stop when Book was tagged down at the eight-yard line for no gain. This was the first of eight consecutive stop for the gold squad. They swarmed the blue squad contributing tackles for loss and sacks and defensive stops to take control of the scoreboard. 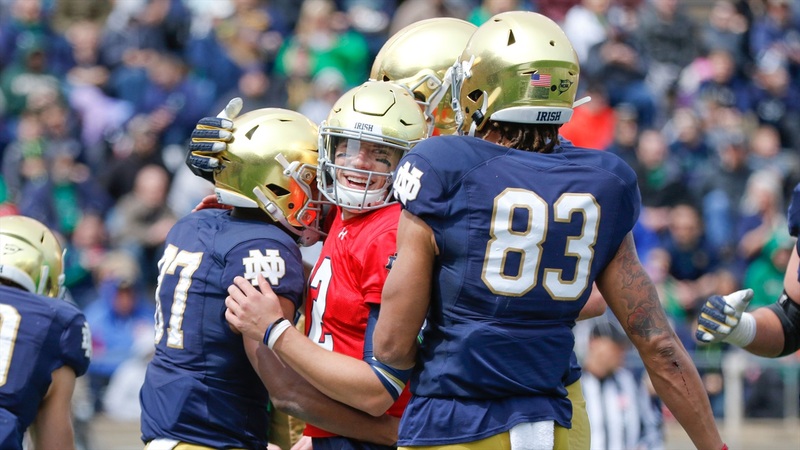 The gold squad defended the blue squad 58-45 in Notre Dame’s 90th Blue-Gold Spring game. The defense dominated and finished with 21 tackles for loss and 15 sacks on Saturday afternoon. They also kept the offense scoreless in the second half. “The good news, no injuries,” stated head coach Brian Kelly. “Always happy about that. There are a number things out there we can certainly get better at. You’re looking for competition and opportunity for guys to grow and learn after a month of practice. This is about how they perform. How do they react when it’s a game situation versus a controlled situation. Book finished 16 for 21 with 220 yards and a touchdown through the air and with his legs. Phil Jurkovec struggled in the second half getting the ball out of his hands. The freshman completed just one of his five pass attempts. Armstrong finished with 85 yards on nine carries. He also caught four passes for 71 yards. “We’ve had a number of sessions where I’ve said he is still cooking,” Kelly said of Jurkovec. “He’s still growing. He learned a lot today about recognition of when the ball needs to come out of his hand and the clock in his head. Those are all things getting a game like this today really helps in that awareness. He’ll learn a lot from today’s game about awareness. One minute and thirty-five seconds left in the first half, Book took the field and led a scoring drive just like he did early on, in the first drive of the spring game. Book led a seven play 44-yard drive to give the Blue team a 45-30 lead with 34 seconds left in the first half. Advantage tilted to the offense. On the drive, Book completed four of his five pass attempts for 40 yards. Three completions to big tight end Cole Kmet and the longest completion was completed to big wide-out Chase Claypool for 19 yards. The drive was capped by an Armstrong 2-yard touchdown burst. The first drive of the game was similar and the ten play drive was capped with a 12-yard touchdown strike to Michael Young from Book. Book started perfect completing his first five pass attempts for 63 yards. Book and Claypool showed a connection all first half including a beautiful 43-yard dart down the left sideline. The two seniors connected four times for 92 yards in the first half. Book completed 14 of his 18 pass attempts for 213 yards and a touchdown. Freshman quarterback Jurkovec struggled early going three and out in his first action after back-to-back sacks by twins Justin and Jayson Ademilola. However, he balanced his nerves and was able to lead a scoring drive on his next chance leading the offense. Jahmir Smith sparked the drive with a 27-yard scamper down the right sideline. Jurkovec followed the long run with a couple of easy completions to Smith and Braden Lenzy for a first down. The 10 play drive was capped by a 1-yard touchdown run by Kyren Williams. Jurkovec finished the first half completing 14 of his 21 pass attempts for 122 yards. Smith finished with 48 yards on six carries and scored twice. Despite the offense holding a 45-35 lead going into halftime towards the end of the first quarter the defense decided to step their game up. On the fifth drive of the game, Khalid Kareem recorded two sacks. This gave the Gold team some momentum. Kareem ended the first half with three sacks. The defense concluded with 12 sacks.